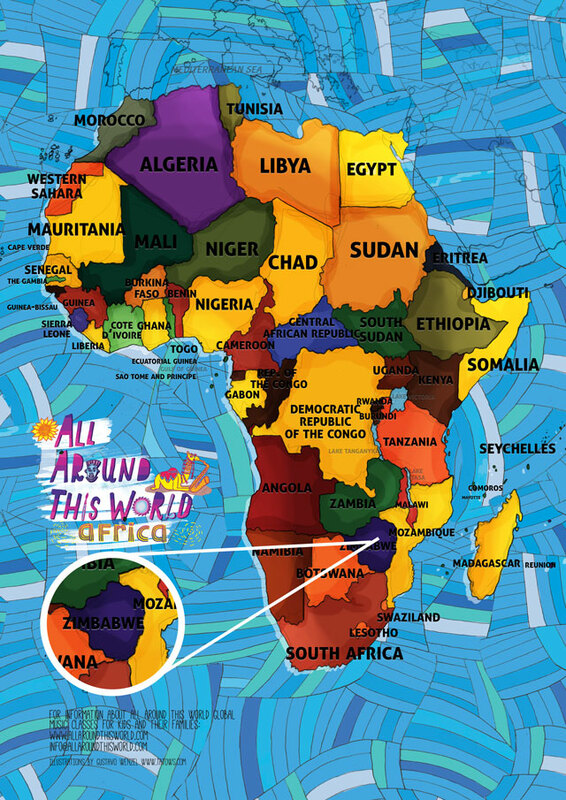 All Around This World’s exploration of Africa includes sing-along, dance-along classroom and homeschool lessons about Zimbabwe for kids . . . Meet the world through music –“come to class” with Jay. This week in music class we travel to wonderful Zimbabwe, an amazingly friendly and welcoming country despite its recent political turmoil and almost continual economic implosion. — OVERVIEW: Zimbabwe’s recent history is full of high highs, such as that of gaining independence, and low lows, such as unfathomable inflation, all set to the bounding musical soundtrack of an ancient thumb piano, a man nicknamed Tuku and some guys who used to tend chickens . . .
— MUSIC: Zimbabwe is home to some of Africa’s most melodically gifted musicians, the most popular of whom seamlessly blend traditional instruments such as the mubra with modern African pop . . .
— LANGUAGE: While English is the national language of Zimbabwe, Shona is by far the nation’s most widely-spoken local language . . .
— IMAGES: Flickr.com’s Zimbabwe slideshow features breathtaking photos of Victoria Falls, a satisfying number of images of yawning lions and only the occasional shot of a trillion dollar bank note or entrenched President Robert Mugabe . . .
— WHEN YOU GO THERE: The tourism industry in Zimbabwe has taken a huge hit due to the nation’s many uncertainties . . .
— MBENDE JERUSAREMA: The Mbende Jerusarema is a Shona dance, usually performed with the accompaniment of a solo drummer, that became significant as a statement of cultural independence . . .